Trees like a beating heart. It’s quiet here. Come in. A golden haze whispered, Stay. She found a home inside herself. Quiet to last a lifetime. n.b. The photo came first. I wanted to see whether, not only could I write a story in exactly 50 words, but could I create that story inspired by the photo. I like a challenge. Thanks to the WordPress editors for this one. It took me nearly a week to do it. Hemingway, I am not. Perhaps “Life was noisy” is closer to Hemingway than you think. I think it is beautiful. You have that essence of peace and fulfillment in these words. Thank you for your comment. I am grateful for it. Lovely! So nice to take a gentle walk with her! Marsha, how ARE you? Thanks for taking the walk, and for commenting. Perhaps I’ll see you in August? Oh wow, Mary, you weren’t kidding. Reds and golds and infinite possibility ahead, all wrapped up in 50 words around a photo — on the weekend, to boot. We certainly were of one mind. I love your happier ending though. And my goodness that’s a beautiful photo! You know what’s really funny? This didn’t start out in the direction of a happy ending. When I looked at my photo, the line that I first thought of was, “She wasn’t afraid of anything. . .” The more I wrote, the more I realized I was not looking in the right direction. That’s the thing about trees — they can be ominous, and they can off solitude. It actually started out with a memory of me running away from home when I was 9. That’s a whole other story! Actually, you didn’t write a story. You wrote a poem – a beautiful, spare, evocative poem! Love it! I agree with you. I’m not sure it’s possible to truly write a story in 50 words. Hemingway supposedly wrote one using 6 words – the key being a story should have a beginning, a middle, and an end. His “story” was: For sale. Baby shoes. Never worn. It’s an interesting exercise in focus, though. Beautiful photo. You excelled at putting down a perfect story for it. Thank you Uzoma. The photo is of my back yard. I love being surrounded by trees. I went from there. I like reading you waaaaay more than Hemingway. Your ruby red trees beckoned me and your words made me stay. I like Mary more than Hemingway too. In fact, I like her more than most writers I read. Thank you (both)! I like Hemingway, his short stories, anyway. His novels are a little to macho for me, all that manly man posturing and being all angsty that the world isn’t what he originally thought it should be. I guess this may be kind of a sad thing, but I’m a believer that you can’t go home again (with “you” meaning, of course, “I/me/myself”). And so, operating from that mindset, these lines particularly call to me: “Standing beside three trees, red as beating hearts/She found a home inside herself.” Lovely photo and awesome writing in 50 words, Mary. It’s not sad at all, Leigh. I feel the same way. Have you read Look Homeward Angel by Thomas Wolfe? Thank you for your lovely comment. I really should, Mary; we toured his home in my schoolgirl days. I’ve begun LHA a couple times. The last couple years (as my kids age and I have a little more free time), I’ve been trying to revisit literature I never got to read; LHA is on the list. So lovely, Mary. I really enjoyed this! Thanks, Cathy. I enjoyed writing it. The image is beautiful and the story reads like a poem. The last two lines really speak to me. Thank you, for the image! After seeing that stunning photo you got of yourself in the mirror, I got the Distressed FX app and started playing around with it. I love it. 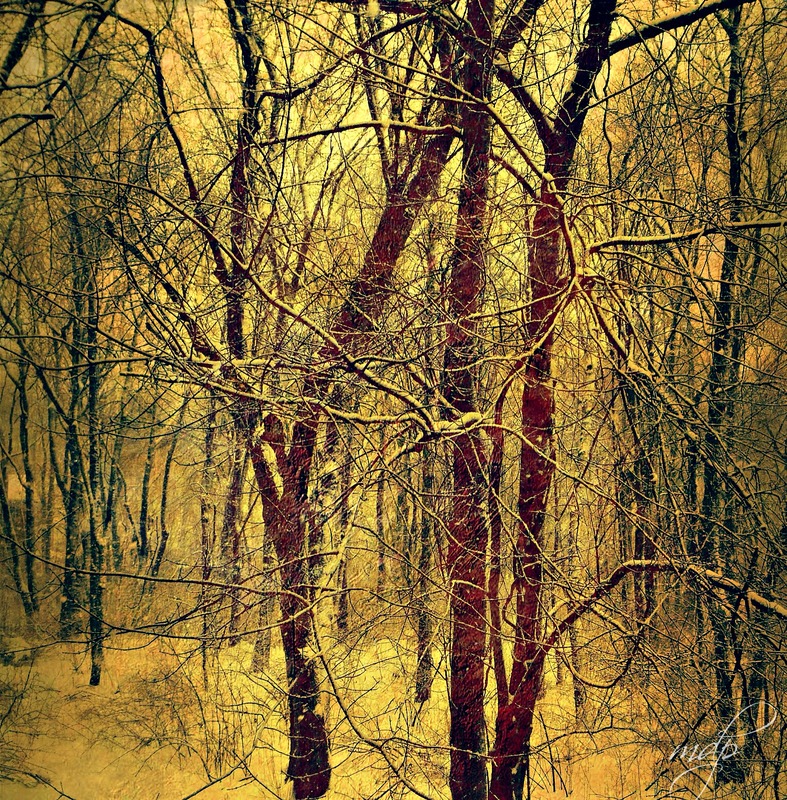 This photo of my back yard on a snowy day was the result. Mary, I’m thrilled to think I had a part in your beautiful creation! I’ll be looking forward to seeing what else you do with the app. It is fascinating and fun, isn’t it? Photo opened a door. Words enchanted reader. Trees accepted. Elegant. This is perfect Mary. The photo, the story and the marriage of the two! Thanks, Mae. A last snowy photo before the coming glorious sunshine (let’s hope)! Cayman, you are always kind to me. Bless you for that! Utterly wonderful photo and story. It seems a beautiful poem of calm to me.